According to what Vanguard newspaper reported, for 36 year-old Mrs Mercy Nnamdi, the woman whose one-year-old son was allegedly killed by her husband recently in Ago, Okota area of Lagos, over her husband’s allegation that she was sleeping with his father, life could never have been more cruel. This is because never in her wildest imagination had she envisaged that a man she had known almost all her life could mete such inhuman treatment on her. As you read this piece, Mercy is going through excruciating pains in a private hospital in Okota where doctors are battling to save her life. In fact, the once bubbling woman looks a shadow of herself, as medical report showed that she sustained a third degree burns from the hot iron her husband of two years used on her on Saturday, April 7 2012, which was exclusively reported by Vanguard. Presently, the badly burnt woman maintains a particular position, by sleeping on her back. She wears an adult pampers when she eases herself, with a tissue paper by her side, with which she cleans the fluid coming out from the burns. Help, as gathered, was far from the Imo state-born woman, as none of her neighbours attempted to go and find out what was happening when she was desperately shouting for help. Crime Guard gathered also that on several occasions, some of the neighbours invited policemen from Ago division who cautioned her husband after which he was made to sign an undertaking never to raise his hands on his wife. Family sources hinted that signs of danger in the marriage reared its ugly face early after the two love birds fell in love 16 years ago, when Mary was barely 22 years old. But she was apparently blinded by love, hoping that her heartthrob would outgrow his anger someday, which was never to be. Narrating what led to her being a patient in the hospital, Mary stated, “It all happened on a Saturday. I had prepared boiled yam, awaiting the arrival of my husband. After a long wait, I decided to eat mine and left his on the table. He came back few minutes to 11pm and went straight to bed. Then at about 1 a.m., power was restored and he went to put off the power generating set and switched over to electricity. After that, he started ironing his customers’ clothes because he is a dry cleaner. I was later woken up by the cry of our one-year-old baby who apparently needed breast milk. All the while, we were outside before power was restored. Before retiring inside, I took my bath and fetched water for him to have his. I was fast asleep when I was woken up by a sharp pain on my back. I thought it was a night mare. But when I opened my eyes, lo and behold, my husband was planting the hot iron he was using on the clothes on me. Immediately I turned, he planted it on my chest. When I raised my hand to prevent it, he planted it on one of my hands . By then I did not know what to do. I started screaming and calling on my neighbours for help. I raised my leg to prevent him, again, he landed the hot iron on me. As he planted the hot iron hard on my flesh, he would use a screw driver to peel off the flesh. At a point, I became too weak to shout. I begged him to stop but he would not. Rather, he would ask me to tell him how many times his father slept with me. Even in pains, I begged him to listen to himself and imagine what he was saying. Pausing for a while and staring at the ceiling, a position she has been maintaining for several hours, she continued, “ at that point, my baby woke up and started crying. I begged him to allow me breast feed the baby. But before I could finish the statement, he placed the hot iron on my breasts, threatening to kill me if I shout. As he lifted the iron, I saw that the flesh from my breast had stuck to the iron surface. Again he pressed it harder on my stomach, leaving it there. I managed to turn, only for the iron to land on my lap. He told me there was no way of escape for me that night, that members of his gang were outside to take my corpse to an unknown destination by the time he finished with me. At that point, I knew the end had come for me. I managed to shout out for help with all the strength in me but I could not. At that point, he forcefully took Ebuka from the bed and went outside. I decided to go out because I did not know what he would do next when he came back. I cannot tell how I crawled out of the room. But I found myself in the kitchen naked, from where two men who saw me gave new rapper to cover myself. “As I was there, trying to fathom how I would escape from the compound, somebody shouted that my husband had killed my child. That was the last thing I heard. Residents of Number 3, Lambe street, Ago confirmed to Crime Guard that they simply refused to go to Mary’s rescue that night because it was late and also that her shout for help had been one too many. One of them said, “ Since they started living as husband and wife, there had never been a time we did not experience shout or crisis from their one-room apartment. It is worse any time the man came home drunk. We have even gone to report to the police when it became too much because we did not want a situation where he would kill her one day and we would be held responsible. Even at that, he did not stop. “Several times, the woman had wanted to go back to her family but she wouldn’t. Even her father-in-law had advised her to leave when she travelled home last December because he was tired of the endless reports of his son battering his daughter in-law.” Weeping, after pausing for a while, Mary recalled how he met her 37-year-old husband. “We knew each other since 1996. The relationship blossomed until 2010, when he went for introduction in my village. But that was never to be as she revealed that rather than continuing learning hair dressing, she started selling pap, all in a bid to make ends meet and apparently as a demonstration of her love for Henry. “He started showing his real colour later. He started by refusing to drop money for house keep and even when I begged him to rent a shop for me, he didn’t. Rather, he used the money to drink beer and smoke. When I advised him against his drinking and smoking habit, he would flare up and the next thing would be to hit me. Sadly, the anguished woman is faced with another predicament which is her inability to pay her medical bills. Already, Crime Guard gathered that her bill had amounted to N200,000. Following this development, the hospital is threatening to stop treatment. Presently, the dressing of the burns which ought to be done on daily basis has been extended to once in two or three days, as a daily dressing cost s N10,000. Sobbing uncontrollably and at the same time questioning her choice of partner, she revealed that her family members had not shown up since the incident occurred, as none of them, according to her, was aware of the incident. “My mother must not hear of this because it will kill her. She is presently taking care of my sister who just put to bed in Owerri. Crime Guard learnt that since the incident took place, her father in-law had been responsible for the hospital bills. though their management had tried to attend to Mary’s case, there are indications that it might discharge her if the accrued bill is not cleared. One of the doctors who identified himself simply as Eze explained that “she had a third degree burn and her case may deteriorate if she does not receive adequate care. 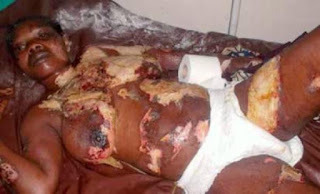 “The husband used pliers on her skin and decimated her. Then a hot iron was applied on her face, body chest, and her two breasts. However, the alleged perpetrator of this dastardly act, Mr Henry Nnamdi who was arrested by neighbours, is currently at the State Criminal Investigation Department, Panti, Yaba. Efforts to speak with him proved abortive. Please, ensure you use the social media sharing below this page to spread this to your family and friends. May God grant her speedy recovery no parent would wish to see this evil. I think the man needs to be examined by a psychiatry doctor. More also i would strongly advice that the man should be compelled to under go hard drugs test. this is inhuman. He must be brought to book to book. This man should be made to suffer the same way he made his wife suffer. he should be made to go through agonizing pain, slow death is a better option. May God grant the woman speedy recovery. My advice to ladies and women in general is dat we should always be careful in our choice of men and always luk before we leap. Don't be blinded by dis so-called love bcuz 2 me luv is abt 2 send dis woman 2 early grave. That man didn't just wake up one morning to turn into a monster,the signs were there but being an African woman she rather hang in there than be nicknamed 'prostitute' may God help her and give us women the courage to tell a stupid man 'to the left'. may God grant her healing and replace every damage part,gives her a reason to smile again, may the little gentle soul find peace in the bosom of the Lord. The 'an eye for an eye' law should be revisited, dusted and applied on the rascal idiot. Oh y ..i sheard tears wen reading this .i pray for a speed recoverin upon .Bt sm pple ar heartles, even as she is pleading in dat condition stil u ar nt touched(the husband).sentence to death by brutal shootin no mercy! Hay this one an eye for eye, tooth for a tooth. And surely God will accept that without any qualms. Am nt here too judge anybody bt i tink d woman is at fault in some way she shuld av aleast leave dat hus wen she knw d she kind of animal she married ask for d man God almighty wil judge him nd d soul of dat innocent child he killed wil also judge him. This is not fair at all. I pray for quick recovery for this woman. May God heal her and wipe away her tears. i dont even know how 2 desctibe dis heartless stupid idiot. can u create de toe of a human? what a useless smoking drunker of no purpose. may u b cursed for de rest of ur life. an idiotic idiot, go away. peace be on de innocent boy i know he is with de Lord. May our Almighty FATHER grant the poor woman physical, psychological and spiritual healing in JESUS Name! The man should be left to rot in jail because he is a security risk...and really needs deliverance. Aktualnie rynek usług rachunkowych nie moiż upominać się na brak sławy. zdecydować się na zarejestrowanie prywatnej działalności gospodarczej. Takie rozwiązanie będzie dla licznych ludzi niezwykle interesujące, ponieważ wiadomo, że wygodnie jest stać się szefem dla samego sieci. Co prawda z założenia własnej firmy wynika wiele obowiązków, które pociągają do odpowiedzialności każdego z przedsiębiorców. na gospodarczym rynku, jakie mogą być wymierzone w pieniężnych wartościach. postawili się na stworzenie własnej firmy. W końcu wszyscy z nich są zobowiązani do rozliczenia się z instytucjami finansowymi państwa, jako fragment krajowej gospodarki. można o wszystko zadbać osobiście. Z uwagi na to korzystają oni z propozycji oferowanych na rynku, które stają się się świetnym rozwiązaniem. He should enjoy his life in jail because if he lives out, he's going to end the life of this innocent woman.